OG-UDC is an openGear 10-bit broadcast quality up, down, cross-converter that bridges HD and SD video resolutions. The OG-UDC provides 3G-SDI input and output, HDMI output and two 3-pin terminal block connectors for analog audio Outputs. The OG-UDC can be controlled by DashBoard network control software. 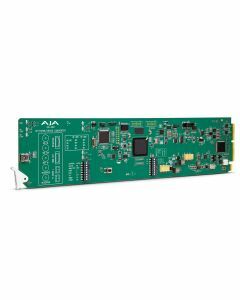 Designed for use in high density openGear 2RU frames including AJA’s OG-3-FR 2RU frame, new DashBoard Software support on Windows®, macOS® and Linux® offers remote control and monitoring of the openGear architecture and provides convenient and industry standard configuration, monitoring and control options over a PC or local network.